1, 2, 3..it’s a Hat Trick! Over the past few months, I have been sharing with you information on the Runners World Classic, which took place this past weekend. As mentioned in those notes, tweets and what we else I use to communicate, was the fact that I was running the “Hat Trick” which was a 5k, 10k and the half marathon. Well, it is done and I survived though if you happen to see me walking this morning, you will see a sore individual! Overall, the weekend was great. Very well run, lots of vendors, decent music, things for the kids, celebrity appearances and more. 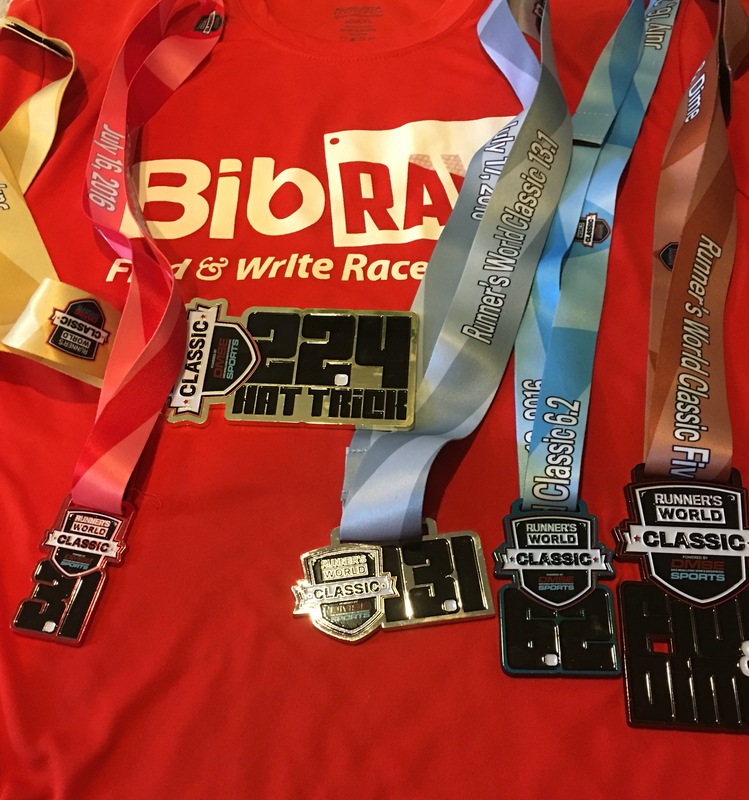 I had a few worries about running three races over 24 hours but that was overblown to be honest – basically it is like training “fast”for Reach the Beach (which is a 200 mile race I run with the Guzman Guys). My times were pretty good amazingly with a PR in the 5k and “ok” runs in the other two (though I felt I ran the half the best of the three races as my strategy played out well). This was even as I had some lousy training weeks leading up to these races! As for a full review of the race weekend and my “blow by blow” detail of each run, that will be up over the next few weeks. I have plenty to share! In the meantime, here is a “quickie” list of the Runners World Classic! Great Medals: “Wow” is all I can say about the medals. For running the Hat Trick, I received one medal for each race (5k, 10k & Half Marathon) plus the “5 & Dime medal” (that is if you run the 5 and 10ks) and the “Hat Trick” medal by completing all three. Great Volunteers: I can’t say enough good things about the staff at these events. They care for your safety, they provide the means for success (great supportive aid stations) and were always ready to answer a question. Well done! Not a big field: There were about a thousand runners per race so it was never crowded. The starting gates for the 5k and 10k were a bit messy (one could not get to their pace area if they ventured over to late). Otherwise, even when running down narrow strips on the course, there was plenty of room to pass. Lots of Vendors: Have you ever had Yasso Frozen Yogurt? You should try it because I loved it. They were parked near the finish line and were giving out free bars to anyone who wanted one. Just great! Challenging Course and Conditions: If you are running a race in the summer, it is going to be hot. That is a given. But not every course is challenging that one runs. I would say that this race had a nice mix with the 5k reasonable and the other two tougher! The half featured plenty elevation movements up and down which contributed to a slower time for me even as I believe I ran they race better than anyone I have run before! That’s about it for now. As mentioned, I will be back with more details in the days and weeks ahead! Previous Post 2 down, 1 to go!